Have you ever been at a craft show and wondered how the artists make what they do? Here's your chance to get a glimpse into how I make some of my handcrafted chainmaille jewelry and try it out for yourself! I am very excited to announce that on Friday, October 11 from 7:00-9:30pm I will be teaching Introduction to Chainmaille Jewelry at the new Cabot Street Studios in Beverly, Massachusetts. 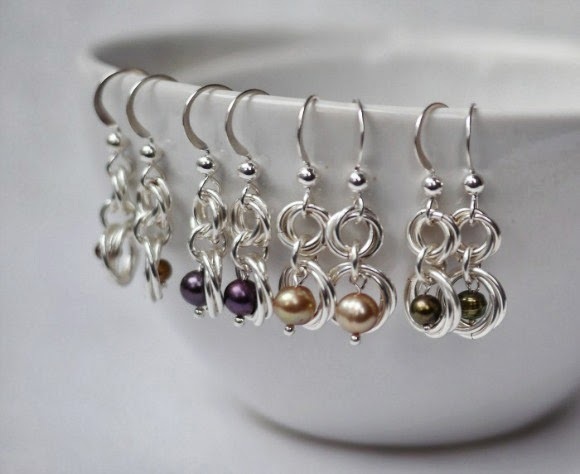 You will learn chainmaille basics, including two weaves, and will leave the class with a pair of earrings (similar to the ones pictured above, or put your own spin on them!) and a keychain. It is a wonderful opportunity to learn a new skill and have a Friday night out with a friend in this awesome new community space. For more information and to register, click here. Spaces are limited and are filling up!